In this experiment, a type of performance-based contract called Pay for Success, the county government had pledged to repay private investors for the successful reduction of out-of-home placements of children whose primary caregiver was homeless. What did this mean for Courtney? It meant that she was assigned a caseworker dedicated to her, someone who would look at her particular circumstances and who would set out a tailored plan to help her turn her life around with the end goal of reuniting her with her children. It meant that her caseworker could work across the county service providers to identify the right mix of services for Courtney. It also meant that a dedicated group of stakeholders was meeting regularly across government and nongovernment entities to focus on one thing: Reuniting Courtney and her children (and other families in similar circumstances) as quickly as possible. By focusing on outcomes, Pay for Success contracts encourage service providers to tailor their interventions according to what works for their target population. For this reason, they may be particularly suitable for addressing the needs of historically marginalized individuals, like Courtney and her family, who have a complex range of needs. With a combination of assistance in addressing existing debts, classes in financial management, and family counseling, Courtney was able to reunite with her children, enroll them in supportive school environments, and stop the cycle of dependency on the foster care system. The result was not only a better family outcome, but also a reduction in the enormous direct costs to the county that would otherwise have been incurred had Courtney’s children remained in county care. Government plays a critical role in ensuring that all citizens, regardless of privilege or circumstance, receive the basic services necessary to live safe, healthy, and productive lives. Beyond public goods, such as street lights and basic education, the government also provides social services that address market failures, particularly as they impact marginalized populations. Given limited budgets, government is continually searching for ways to deliver these services in the most efficient and effective manner. The way that government funds and delivers social services takes varied forms and has had shifting patterns over time. For instance, government funding often reaches beneficiary populations via nonprofits responsible for delivering services — in fact, it is estimated that over half of social services are provided through this type of public-private partnership.3 In fiscal year 2014, for example, the U.S. Department of Health and Human Services contracted for $21 billion worth of services.4 Such funding can sometimes be in the form of grants; however, most often the government contracts with the nonprofit sector using fee-for-service, fixed-cost, and performance-based contracts. Performance-based contracts, an umbrella term used to describe contracts that make compensations partially or fully contingent upon performance achievement, have become increasingly used to incentivize service providers to deliver results. The past two decades have seen a further push under the umbrella of performance-based contracts toward contracts that provide incentives to deliver measurable results in the form of outcomes, as opposed to outputs. Pay for Success, also known as a social impact bond, is the most recent iteration of such outcomes-based funding. Outcomes-based funding has enormous potential to help achieve equitable access to quality social services. The greater focus on outcomes can lead to flexibility, innovation, and adaptive learning in service delivery, and an emphasis on evaluation can enhance transparency in social spending and facilitate funding what works. The U.S. government began to contract for social services in the late 1960s. At the time, high demand for skilled workers resulted in several pieces of legislation that allowed for service delivery contracts with nongovernmental organizations.5 In 1972, this was further formalized through the Comprehensive Employment and Training Act, which “paved the way for community-based organizations to occupy a major role in delivering services in the human services field.”6 Ever since this contracting model was established, policymakers have been trying to improve the contracting process and optimize government’s role as a contract manager. Initially, the primary form of payment method was either cost reimbursement (reimbursing approved expenses), fixed cost (paying a set price for a set of services, regardless of expenses), or fee-for-service (payments per time unit spent delivering the service or per beneficiary served). In other words, government contracting focused on inputs delivered, such as the number of staff, facilities, equipment, and supplies used (see Figure 1). In this type of design-focused contracting, there could also be contracts around the process of delivery, such as those based on statements of work or on service definitions. Source: Lawrence Martin, “Performance-Based Contracting for Human Services: Does It Work?” Center for Community Partnerships, College of Health and Public Affairs, University of Central Florida (2005). However, input-based contracts often did not produce desired results and highly restricted service providers. Consequently, in the 1980s, government contracting began to shift from input-based to performance-based. Broadly, performance-based contracting (PBC) refers to contracts where compensations (such as payment, extension, or contract renewal) are either partially or fully dependent on the achievement of some performance metrics, which can include outputs, the quality of those outputs, or outcomes (or some combination thereof). Output measures include, for example, the number of beneficiaries reached or the volume of services delivered. Outcomes, on the other hand, include measures of impact on the beneficiary, such as improved health indicators or entry into sustained employment. It is important to note that definitions of PBC vary greatly, from statements of work based on performance outputs, to contract renewal based on outcomes, to a payment scale tied to degrees of performance. Although PBC has been strongly supported by policy, its use is still relatively rare, compared with input-based contracting, as a 2012 survey of nonprofit-government contracts revealed (see Figure 3). In this sample, only nine percent of small organizations used performance-based payments alone, while less than a quarter of large nonprofit organizations ($1 million or more in annual expenses) reported contracts with performance-based payments. Slightly more, 28 percent, reported contracts with a combination of unit cost payments and performance-based payments. 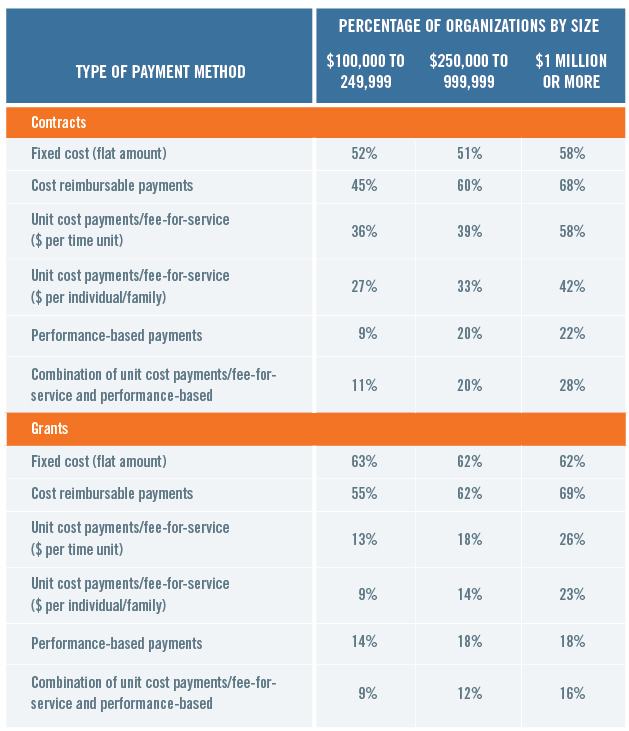 Among grants to nonprofits, between 14 and 18 percent used performance-based payments alone, and between nine and 16 percent used a combination of the two. One clear trend: The larger the organization, the more likely it is to use PBC. Notes: Figures are based on nonprofit organizations included in the sampling frame. Missing or non-applicable answers were excluded. Respondents were allowed to provide multiple responses to the question related to the main services provided by their organization. Thus, survey responses will not total 100 percent. Source: Sarah L. Pettijohn et al, "Nonprofit-Government Contracts and Grants: Findings from the 2013 National Survey," Urban Institute (2013), available at http://www.urban.org/sites/default/files/publication/24231/412962-Nonprofit-Government-Contracts-and-Grants-Findings-from-the-National-Survey.pdf. Most PBCs to date have provided compensation for the delivery of outputs, and few have provided compensation for outcomes. Further, many PBC contracts have only a small portion of payment (such as ten percent) tied to outputs or outcomes, or simply contract renewal, while the remainder is tied to prescribed inputs. This may not allow providers the flexibility required to improve service quality. Social impact bonds or Pay for Success contracts are a form of PBC that explicitly focuses on outcome achievement and almost always tie 100 percent of government payments to outcomes.26 They differ from traditional PBC in that private investors provide upfront capital to service providers. The private investors, often a combination of senior and subordinate investors, are repaid by an outcome funder (usually government) contingent on outcome achievement.27 In this model, the investors absorb the financial risk that would normally be held by the service provider and government. The idea of social impact bonds originated in the United Kingdom in 2010. The aim of the first social impact bond was to reduce the high rates of prison recidivism among short-term male prisoners. In 2012, this model came to the shores of the United States at the Rikers Island jail in New York City. Since then, there have been an additional 13 Pay for Success transactions introduced across the country for a range of social issues, including child welfare, homelessness, and early childhood education. Why do outcomes-based contracts matter? Outcomes-based contracts provide greater flexibility to service providers, which may increase the quality of their services. They also require outcome evaluation, which allows government to direct its funds most efficiently. In the example from Ohio, the various service providers working with Courtney would have each had separate goals and no incentive to coordinate under input-based contracting. She may never have been encouraged and supported to meet all of the requirements for family reunification. Frontline Services was able to provide higher-quality services under the outcomes-based contracting model because it spent far less time reporting on a government-issued laundry list of performance indicators that had little relevancy. Rather, Frontline was contracted to do whatever was necessary to achieve the outcome of utmost importance: family reunification. However, outcomes-based contracts are not without their risks and challenges. Firstly, setting them up can be a very complex and costly process, requiring considerable time to negotiate between actors and finalize the technical aspects of the deals.32 While the nature of an outcomes-based contract involves a shift of financial risk from the government to the investors, they may also be a risky undertaking for governments and service providers, who take on more reputational risk in the face of the heightened scrutiny of the outcomes-based structure. In particular, for governments, paying large returns to private investors may be damaging to their public image if the nature of the outcomes-based contract is not effectively communicated. The government will also continue to face the risk that they must bear responsibility for the consequences of the contract: For example, if the contract allows service providers to “cherry pick” the beneficiaries served, and thus avoid the neediest individuals.33 This aspect emphasizes the importance of tightly defining the target population and impact metrics, to ensure the results of interest closely align with the government’s goals and that meaningful outcomes are achieved. The trend to measure results and link them to compensation is not limited to the United States. In health, for example, results-based funding is being used in countries such as Spain, Sweden, and the United Kingdom.34 Additionally, as of this publishing, social impact bonds were contracted across 12 high-income countries. The landscape has also shifted over the past five to ten years in developing country contexts. Increasingly, institutions such as the World Bank,35 the U.S. Agency for International Development, and the U.K. Department for International Development36 are using results-based contracts to address some of the most intractable challenges facing the developing world, including maternal and child health and schooling outcomes. For the United States and globally, PBC provides a tremendous opportunity to ensure not only more effective government spending but also broader systemic change. At its best, PBC — particularly that which focuses on outcomes — has the potential to increase collaboration across stakeholders, strengthen monitoring and evaluation systems, and drive performance management to allow for adaptive learning. However, PBC is not without costs and risks: Arranging outcomes-based contracts may be more costly and, relative to input-based contracting, may be more risky. The highest priorities for the field moving forward will be to identify which services would benefit most from outcomes-based funding, to establish protocols on procuring outcomes-based contracts to reduce transaction costs, and to determine appropriate guidelines to ensure quality while allowing for service flexibility. The task may sound abstruse, but in Courtney’s case and in many others, the opportunity for an improved system is overwhelmingly clear. The author would like to thank Sophie Gardiner and Katie Smith for their research assistance. 1 Name has been changed to protect the identity of the beneficiary. 2 Emily Gustafsson-Wright, Sophie Gardiner, and Vidya Putcha, “The Potential and Limitations of Impact Bonds: Lessons Learned from the First Five Years of Experience Worldwide,” Brookings Institution (2015), available at http://www.brookings.edu/research/reports/2015/07/social-impact-bonds-potential-limitations. 3 Elizabeth Boris et al., “Human Service Nonprofits and Government Collaboration: Findings from the 2010 National Survey of Nonprofit Government Contracting and Grants,” Urban Institute (2010), available at http://www.urban.org/sites/default/files/alfresco/publication-pdfs/412228-Human-Service-Nonprofits-and-Government-Collaboration-Findings-from-the-National-Survey-of-Nonprofit-Government-Contracting-and-Grants.pdf. 4 National Contract Management Association and Bloomberg Government, “Annual Review of Government Contracting: 2015 Edition” (2015), available at http://www.ncmahq.org/docs/default-source/default-document-library/pdfs/exec15---ncma-annual-review-of-government-contracting-2015-edition. 5 Paul Terrell, “Private Alternatives to Human Services Administration,” Social Services Review 53 (1) (1979): 56–74. 6 Shabu Varghese, “A Paradigm Shift in Human Service Delivery in the United States: A Change in Approach from the Government to the Governance Model,” Journal of Public Policy (2015), available at http://jpublicpolicy.com/2015/11/29/a-paradigm-shift-in-human-services-delivery-in-the-united-states-a-change-in-approach-from-the-government-to-the-governance-model/. 7 U.S. Government Accountability Office, “Contract Management: Trends and Challenges in Acquiring Services,” Statement of David E. Cooper, director of acquisition and sourcing management before the Subcommittee on Technology and Procurement Policy, Committee on Government Reform, U.S. House of Representatives (2001), available at http://www.gao.gov/assets/110/108858.pdf. 8 Lawrence Martin, “Performance-Based Contracting for Human Services: Does It Work?” Center for Community Partnerships, College of Health and Public Affairs, University of Central Florida (2005), available at http://www.cdss.ca.gov/ccr/res/pdf/performance/3.%20PBC_Does_it_Work.pdf. 10 Varghese, “A Paradigm Shift” (2015). 12 Gustafsson-Wright, “The Potential and Limitations of Impact Bonds” (2015). 13 Office of Policy Development and Research, “Low Income Housing Tax Credits,” U.S. Department of Housing and Urban Development (2016), available at https://www.huduser.gov/portal/datasets/lihtc.html. 14 Sithara Kodali, “The Movement Towards Government Performance,” Third Sector Capital Partners (2016), available at http://www.thirdsectorcap.org/blog/the-movement-towards-government-performance/. 15 New Markets Tax Credit Coalition, “New Markets Tax Credit Fact Sheet” (2016), available at http://nmtccoalition.org/fact-sheet/. 16 Martin, “Performance-Based Contracting” (2005). 17 U.S. Office of Management and Budget, “Memorandum for Chief Acquisition Officers Senior Procurement Executives,” Executive Office of the President (2004), available at http://georgewbush-whitehouse.archives.gov/omb/procurement/pbsa/pbsc_increasing_070704.pdf. 18 Kodali, “The Movement Towards Government Performance” (2016). 19 Nicole Truhe, “How the Every Student Succeeds Act Rewards Results Through Evidence-Based Programming,” America Forward (2015), available at http://www.americaforward.org/blog/the-every-student-succeeds-act-paying-for-success-in-education. 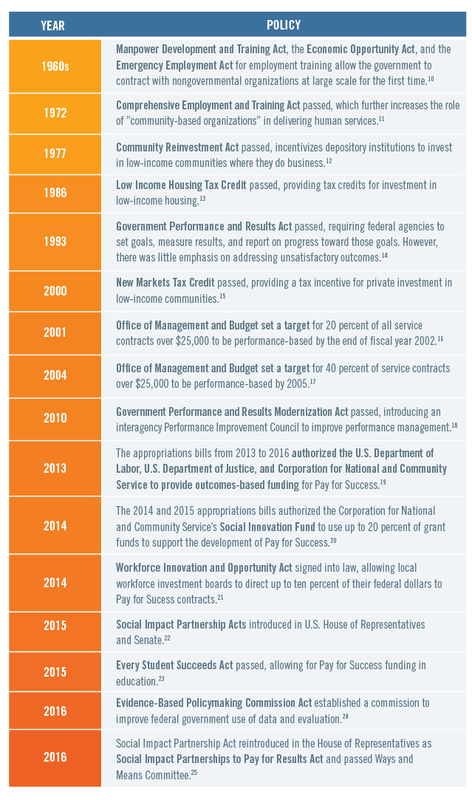 20 Corporation for National and Community Service, “SIF Pay for Success” (2016), available at http:// www.nationalservice.gov/programs/social-innovation-fund/our-programs/pay-success. 21 Gustafsson-Wright, “The Potential and Limitations of Impact Bonds” (2015). 22 U.S. Congressional Record, “H.R.1336 and S.1089, 114th Congress” (2015), available at https://www. congress.gov/search?q=%7B%22source%22%3A%22legislation%22%2C%22congress%22%3A11 4%7D. 23 Truhe, “How the Every Student Succeeds Act” (2015). 24 Justin Milner, “Everything You Need to Know About the Commission on Evidence-Based Policymaking,” Urban Institute (2016), available at http://www.urban.org/urban-wire/everything-you-need-know-about-commission-evidence-based-policymaking. 25 Committee on Ways and Means, “Markup of Bills to Improve TANF,” U.S. House of Representatives (2016), available at http://waysandmeans.house.gov/event/39841647/. 26 In some social impact bonds, outputs rather than outcomes are chosen as metrics, though the general idea is to focus on outcomes. 27 For clarity, impact bonds, despite the name, are not bonds in the traditional sense. The term “social impact bond” in this chapter is defined as an arrangement where payments to investors are dependent on, and positively correlated with, positive outcomes. For a number of uses of the term that do not fit the commonly used definition, see Emma Tomkinson, “When Is a Social Impact Bond (SIB) Not a SIB, and Why Should We Care?” Personal Blog (2015), available at http://emmatomkinson.com/2015/05/28/when-is-a-social-impact-bond-sib-not-a-sib-should-we-care/. 28 Truhe, “How the Every Student Succeeds Act” (2015). 29 Corporation for National and Community Service, “SIF Pay for Success” (2016). 30 Committee on Ways and Means, “Markup of Bills to Improve TANF” (2016). 31 Gustafsson-Wright, “The Potential and Limitations of Impact Bonds” (2015). 34 William Savedoff, “Basic Economics of Results-Based Financing in Health,” Social Insight (2010), available at https://rbfhealth.org/sites/rbf/files/RBF%20Economics_0.pdf. 35 Results-Based Financing for Health, “Mission,” World Bank (2016), available at https://www.rbfhealth.org/mission; World Bank, “Results-Based Financing and Results in Education for All Children” (2016), available at http://www.worldbank.org/en/programs/reach#2. 36 United Kingdom Department for International Development, “Payment by Results Strategy: Sharpening Incentives to Perform” (June 26, 2014), available at https://www.gov.uk/government/publications/dfids-strategy-for-payment-by-results-sharpening-incentives-to-perform/payment-by-results-strategy-sharpening-incentives-to-perform.